Baby Declan’s anticipated arrival had so much promise . . . a routine pregnancy for his mom along with a string of normal pre-natal tests; the family was anxiously awaiting his entry into the world. It was determined he would be delivered via c-section and the procedure was about as routine as can be. What happened immediately afterward was anything but normal. From the start, Declan fought to breathe on his own and had to be intubated and put on a ventilator within the first few precious hours of his life. Doctors determined the baby suffered from Persistent Pulmonary Hypertension-Newborn. It means that Declan had no trouble breathing inside the womb, but once he was exposed to the outside environment, he couldn’t oxygenate his own blood. It’s a very rare condition in newborns with a very low survival rate. To complicate things, he was suffering from pneumonia and was dealing with an infection along with damage to his lungs. As his tiny body fought for survival doctors had to repeatedly monitor his blood, initially pricking his foot every hour until they were able to draw blood from the stub of his umbilical cord. All that testing took its toll. Because he wasn’t able to reproduce blood on his own, and due to the amount of blood taken, Declan needed a transfusion on his 5th day of life. This is a story with a happy ending because somebody donated blood and gave another human being another day of life . . . another birthday. That’s the tremendous satisfaction that our donors get every time they donate. It’s what makes blood donation so special because the act of donation has a direct effect on someone else’s life . . . it’s why we call our donors LIFESAVERS. 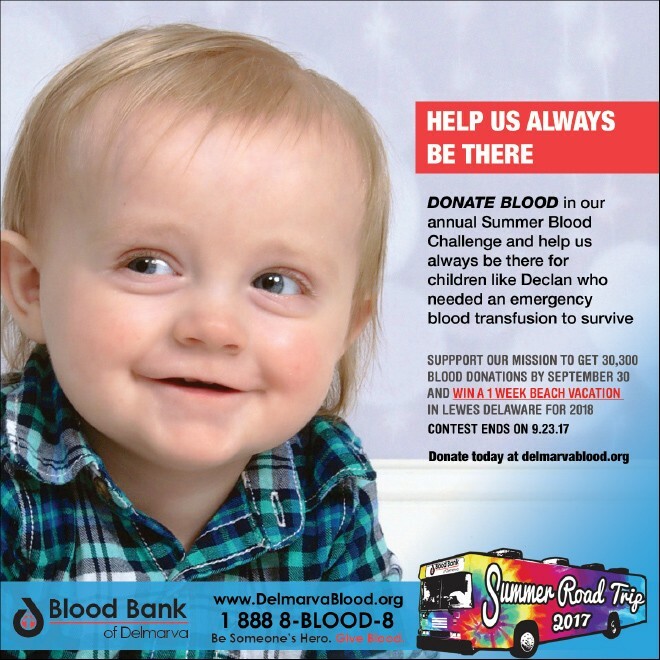 During Blood Bank of Delmarva’s 15th Annual Summer Blood Challenge (SBC) members of our community will not only have a chance to help save lives, but help keep a safe and adequate blood supply on the shelves of our local hospitals. Recent occurrences across the world have put security forces on the highest alert and healthcare providers as well; we all have to be ready at a moment’s notice. What’s heartening to see is that people do respond in an emergency, like after the recent tragedy in the United Kingdom. But why does it take an emergency to get people to take action? The need for blood is constant, and in our region alone it takes 350 donors a day to service our local hospitals. That’s why we constantly urge members of our community to roll up their sleeves, so we’re ready for any emergency. But sometimes people just need a little extra motivation to get them to donate. That’s why this year; BBD has teamed up with the Residences at Lighthouse Cove, Dewey’s only resort style condominium complex in the heart of Dewey Beach on the Rehoboth Bay, to offer more than just a weeklong stay at the beach, but a true beach experience. Discover why we’re so excited to offer this incentive at www.TheResidencesDE.com. We’re also providing a $1,000 TD Bank gift card to cover vacation incidentals. One person who donates blood between now and September 23rd will win it all. We’ll also have weekly gift card winners and special “Saturday Road Trip” blood drives at various Texas Roadhouse locations throughout the Delmarva, as we travel over 10,000 miles this summer to help save lives. You can learn about this year’s Summer Blood Challenge and make an appointment to donate on our website at DelmarvaBlood.org or call us at 888 8-BLOOD-8 (888-825-6638). From all of us at the Blood Bank, we wish you and your family a safe and happy summer season! Michael Waite, former on-air radio personality at WJBR, is the outgoing Director of Marketing & Community Relations for Blood Bank of Delmarva. Michael is the organization’s primary media spokesperson and collaborates with executive management on strategic initiatives to improve organizational performance. He also manages community relations and leads the Blood Bank’s fundraising efforts. 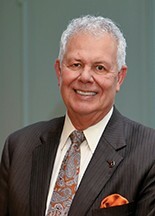 He is a past President and current member of the Board of Directors of the Ronald McDonald House of Delaware, a member of the Delaware State Chamber’s Board of Governors, a 2011 recipient of the Governors Award for Volunteerism and a University of Delaware HRIM Renaissance Award winner.